Last year I gave the first of a lecture series I am developing on famous English women gardeners. There was no better place to start than with Vita Sackville West (and her husband, Harold Nicholson) who together created the famous gardens at Sissinghurst. Vita writes of her first sight of Sissinghurst Castle in 1930. (U-tube video) A castle in ruin in seven acres of muddy wilderness. Vita says, “There was no water or electricity; there was no single habitable room. The amount of old bedsteads, plough share, old cabbage-stalks, old broken down earth closets…should have sufficed to daunt anybody.” Nonetheless, the Nicolsons’ buy the ruins and the farm in the heart of the country, and within easy reach of London. During 1930-31 Vita and Harold traveled between London and Sissinghurst to supervise the clearing up. The redemption of Sissinghurst took the next five years of hard work. By 1938 the young and flourishing garden was open for charity, a garden made within the walls of a moated 16th century manor house. The gardens are now in the care of the National Trust. Millions of visitors have travelled to Sissinghurst; a restored jewel within easy reach from Canterbury and Tunbridge Wells. 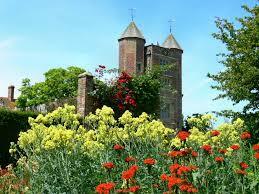 I visited Sissinghurst in 2000 on a garden tour. The spirit of Vita Sackville West and Harold Nicholson remain to this day. The gardens and the world of these two famous people are endlessly fascinating. Do get to know them. Recommending Sissinghurst Castle -Portrait of a Garden by Jane Brown for your enjoyment. This entry was posted in AtoZ Blog Challenge -April 2014 and tagged Harold Nicholson, Sissinghurst Castle, Sissinghurst Castle-Portrait of a Castle-Author Jane Brown, Vita Sackville-West. Bookmark the permalink. I’m not sure I’ve heard of this place, but always happy to learn about somewhere new. Oh my goodness, plan now for an upcoming visit to see this place. I’m writing about Vita SacKville-West for the letter V. Read one of the books I mention on her life before you go. It was only after the garden tour where I saw Sissinghurst that I came home and started reading. Endlessly fascinating. I would love the have the castle to go with those gardens! Wow. Her son has written a wonderful book on Sissinghurst today and farming the land again etc. These were amazing people, complex and a mystery in some ways to us because of their moral choices etc. Endlessly fascinating to me. If it were within my power, the castle is yours! 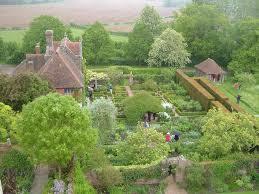 Is your Mom in England where she can actually visit Sissinghurst? I write about Vita Sackville-West for the letter V during the #Challenge. The whole story is fascinating. I would love to see this castle and its gardens! There are a number of lovely books about Sissinghurst that might have to substitute for now until you save enough quarters to go. My husband says I have enough saved now to take a cab to the airport. It is a must see. HIGHLY recommend you read the book I mention when writing the post for the letter V (Vita Sackville West) before going. It is not about the garden, but about her, a complex woman of her times. An affair with Virginia Wolf ETC. I found it fascinating. When you go to Sissinghurst I wish I could go with you. We could talk of writing and gardening, books and our passions. Vita wasn’t the only one who had some. Lovely post. I gave visited Sissinghurst Castle and it is truly beautiful. It’s great reading more about it. Maybe we were there on the same day quietly moving along the paths taking it all in. It’s a place fondly remembered. Let’s hope we both can visit there again. You’d have to have an army of gardeners, I would imagine. I hadn’t heard of this place before, it looks stunning! Great choice for your A-Z theme! What a beautiful place! England seems uniquely suitable for gardens. I’d love to take that garden tour! An interesting story nonetheless, thanks. There is a Sissinghurst Castle garden blog. I love it.